Provide comfort for the family of Marie Tashji with a meaningful gesture of sympathy. 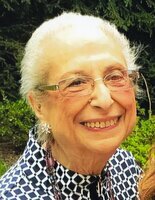 On April 11, 2019, Marie Louise Abdallah Tashji, daughter of Thomas and Linda Abdallah and wife of Terrence Tashji, passed away at home in her sleep surrounded by family. Marie Louise had been undergoing cancer treatment before succumbing. Marie Louise was born on April 8, 1933 in Binghamton, N.Y. where her parents had settled after emigrating from Lebanon. Shortly thereafter, the family moved to Manhattan where her father owned and operated a luncheonette in Greenwich Village and her mother, a graduate of American University of Beirut, worked as an assistant to the editor of the Caravan, an Arab language newspaper, and as a translator for the Ambassador to the Lebanese Mission to the United Nations. The family moved to Brooklyn in the early 1950s. As the only person selected from her elementary school to attend the academically rigorous Hunter College High School, Marie Louise graduated from that school in 1950. Interrupting her education to raise her family, Marie Louise graduated from Hunter College in 1978, the same year her daughter, Laura, obtained her degree from the same school. Over the course of her career, Marie Louise worked in Manhattan at Shell Oil, St. James Church, Salomon Brothers, Prudential Insurance, and Salomon Smith Barney. After retiring from Salomon, she worked as a librarian for the NY Public/Private Schools and a proof reader for the Spectator/Home Reporter. Marie Louise's love of family was rivaled only by her love for St. Mary's Antiochian Orthodox Church. A member of this parish for decades, she served as assistant to the late Father Paul Schneirla, the first female president of the Parish Council, president of the Ladies of St. Mary's, a member of the Arab American Festival committee, and a member of the Saints and Sinners Golf Outing Committee which has raised more than $800,000 for the church. Marie Louise was also a proud member of the St. Mary's Choir where she sang alongside her four daughters and other family members. Pre-deceased by her parents and her beloved brother Eli Abdallah, Marie Louise is survived by her husband of sixty-four years, Terrence Tashji, her four daughters Laura(Tucker), Janette, Georgette and Irene, eight grandchildren Danny, Helena, Tucker III, Tommy, John, Kurt, Isabella and Stephen, and seven great-grandchildren Levi, Jordan, Jeremiah, Tucker IV, Ariel, Garrett and Caroline with another on the way. She is also survived by her sister in law Rose, nieces and nephews Yvonne, Tommy, Kim, and Eli and godchildren Daria and Victoria. Marie Louise loved music, dance and song and all things French. In addition to French, she spoke Arabic and Turkish. She cared deeply for her family and church, and will be lovingly remembered by all for her kindness and the goodness she brought out in others. To send flowers in memory of Marie Louise Tashji (Abdallah), please visit our Heartfelt Sympathies Store. Consider providing a gift of comfort for the family of Marie Tashji by sending flowers. Provide comfort for the family of Marie Louise Tashji (Abdallah) by sending flowers. Hugs and Love to the entire Tashji family from all of the Weslars around the world! Marie was Maid of Honor at Mom's Wedding. and a vital part of the extended 105 family. We loved her so! Blessings upon you all. Marie was so loving, beautiful, intelligent and caring lady with the sweetest voice — all lovely gifts that shine on her precious daughters too. Irene, Jeanette, Georgette, Laura and Terry - our sympathy and warmest thoughts are with you.